Amish With A Twist II BOM Quilt - Includes Backing! Programs - Most Include Backing! 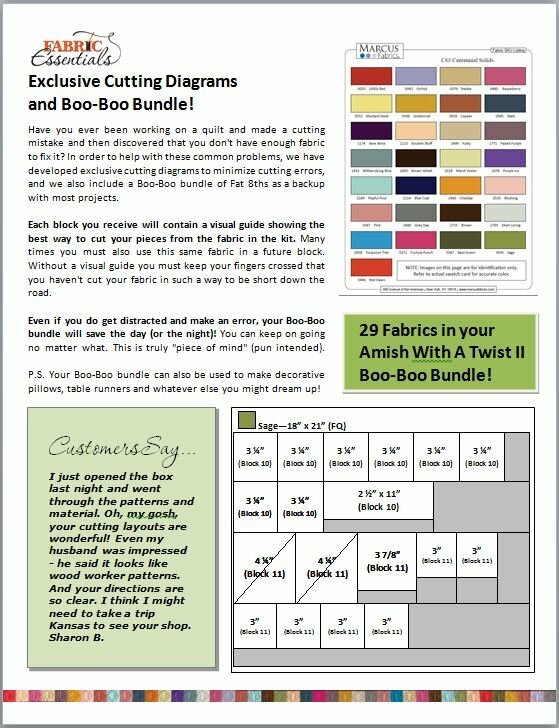 > Amish With A Twist II BOM Quilt - Includes Backing! 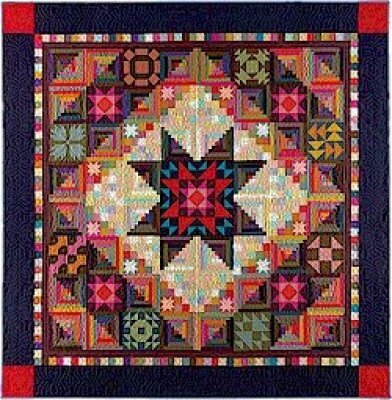 Amish With A Twist II - Flexible Block-of-the-Month (BOM) Quilt! WOW! Nancy Rink has done it again! We are very excited to present the eagerly-awaited follow-up to Nancy Rink's Amish with a Twist creative program! 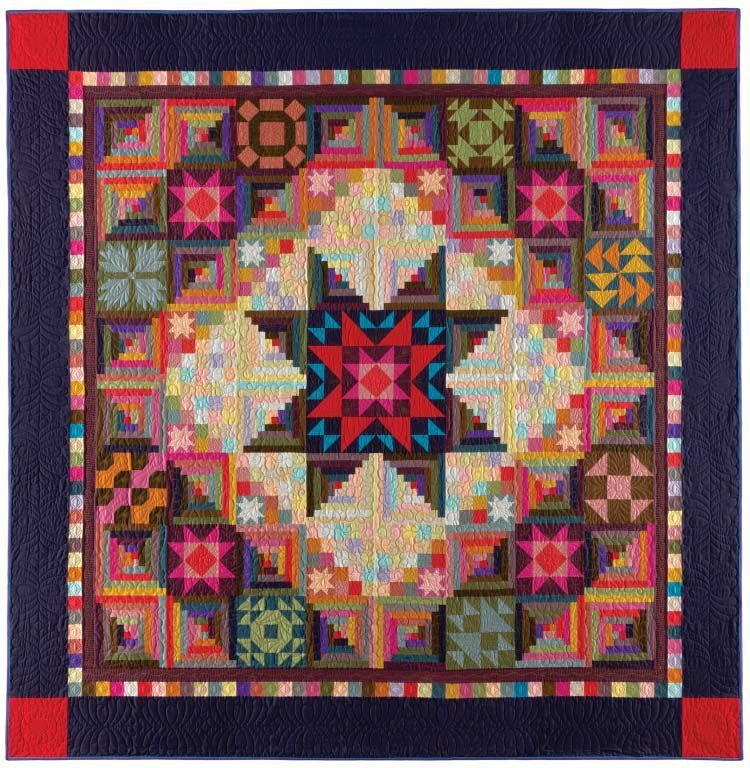 Amish With A Twist II: The Classics draws inspiration for both the block designs and color palette from quilts that are considered to be quintessentially Amish by quilt lovers and collectors. Please note that this quilt could easily be made smaller or larger by reducing the size of the final border. This quilt features Blue Coal borders, a Turquoise Tide Piping, and Purple Ice Binding. More information about making the piping is found below. We only use the original Marcus Centennial fabrics. No substitutions! * Recommendations for notions are included. * Fabric Essentials takes it further with exclusive cutting diagrams! This quilt features Blue Coal borders, a Turquoise Tide Piping, and Purple Ice Binding. Your program includes 6 1/3 Yards coordinating Cream Dots 60" backing or 9 1/2 yards coordinating solid backing. The dots are unusual, and will provide a completely different look on the back side of the quilt! It may be hard to decide! Many people use the fabrics from their Boo-Boo Bundle to create a horizontal or vertical strip of fabrics across the back. Other people make a row of blocks, or scattered blocks across the back. There's no limit to the possibilities! The finished quilt is 105" x 105". Your backing needs to be at least 114" x 114". After removing the selvages, you will have approximately 129in width of fabric to work with. Cut or tear various sizes of strips Length of Fabric (LOF). Sew strips together. You need to end up with around 114in x 114in to have enough for the longarm quilter. This gives you 15in for seams, so you could have up to 30 different vertical strips if you wish. Have you ever been working on a quilt and made a cutting mistake and then discovered that you don't have enough fabric to fix it? In order to help with these two common problems, we have developed exclusive cutting diagrams to minimize cutting errors and we also include a Boo-Boo bundle of Fat 8ths as a backup with most projects. We order extra fabric and can also cut 1/4 yard and 1/2 yard bundles if you need more. Click to order an extra Boo-Boo bundle of Fat 8ths. We encourage you to combine your shipments to save on shipping and handling. We can generally send two or three blocks for the same price as one block, and you save! This is why we offer flexible BOM programs and complete kits. For this program, we recommend two blocks per shipment as the pattern is based upon 6 Installments of 2 blocks each. You can choose how many blocks to get and how often to get them! Many people buy 2 blocks every month or every two months. Others do 6 months at a time and then call us when they are ready for more. This is YOUR program. We will work with you to tailor it to your life and your budget. Shipping and handling is not included in the above monthly program costs, and will vary depending on which month, and how much fabric is being sent. In all cases, we try to send things the most economical way possible. We encourage you to take two blocks per shipment, as this will save you quite a bit. The Amish With A Twist I and Amish WIth A Twist II programs use fabric from the Marcus Centennial Solids collection.View the entire collection.